← Trying My Hand….At Lapin Au Vin! Steak and seafood are my absolute favorites, but when I have a chance to combine the two of them together, it is a match made in heaven. Surf & Turf is on deck, Enjoy! In a blender or food processor place the cilantro leaves and stems, scallions, chili peppers, garlic, lime juice, cumin, and turmeric and blend to a puree. Add some water if necessary to achieve the desired consistency. Peel the shrimp,devein them leaving the tail intact. Place the shrimp in a bowl, and toss with the cilantro mixture. Marinate for about 3-4 hours. When you are ready to cook the shrimp, scoop them up so that more of the marinade remains on one side of each one. Use an indoor grill if possible and either use non=stick spray or a bit of olive oil on the grill. Put shrimp on the soaked skewers with the sliced lemon or limes. Heat the grill to medium-high and place the shrimp marinade-side up on the grill. Cook until almost done, about 2 minutes.Turn shrimp over and cook quickly on marinade side, about 1-2 more minutes. Remove shrimp from grill. Divide the skewers among serving plates. Sprinkle the shrimp with coarse salt, pepper, chili powder, a squeeze of lime juice, and a few cilantro leaves. Posted on February 16, 2012, in Beef, Seafood and tagged Cilantro citrus shrimp, grilled shrimp, Pan seared steak, surf and turf. Bookmark the permalink. 5 Comments. 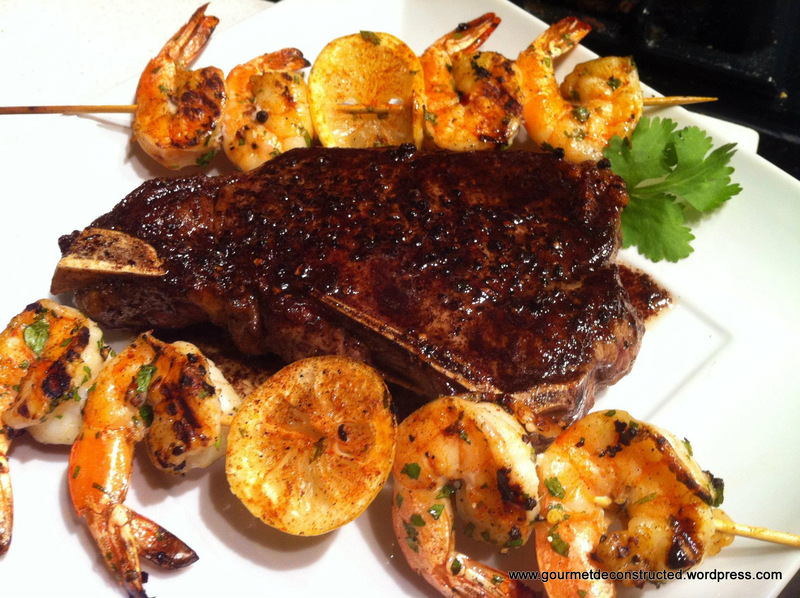 Surf & Turf– my favorite as well.